We have finally secured the Premises that will turn our dream of taking African Cuisine to a mainstream audience a reality. 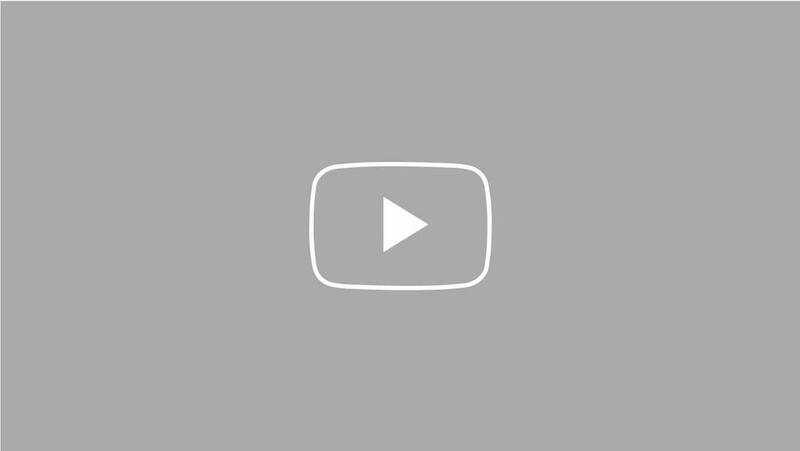 We need your help to kit it out, launch and market it! From our home kitchen, to our street food stall and now our Casual Dining premises! We love to educate and empower folks with the confidence that comes from cooking and learning a life skill. This is also a chance to provide more jobs and opportunities for the long term unemployed. 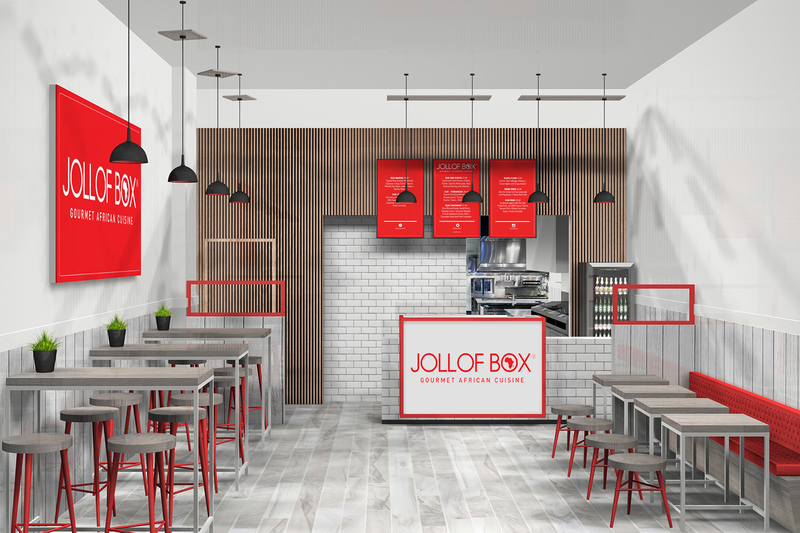 Here at Jollof Box we want to to make African cuisine more accessible and approachable while, educating all on the health benefits and heritage of West African Food. 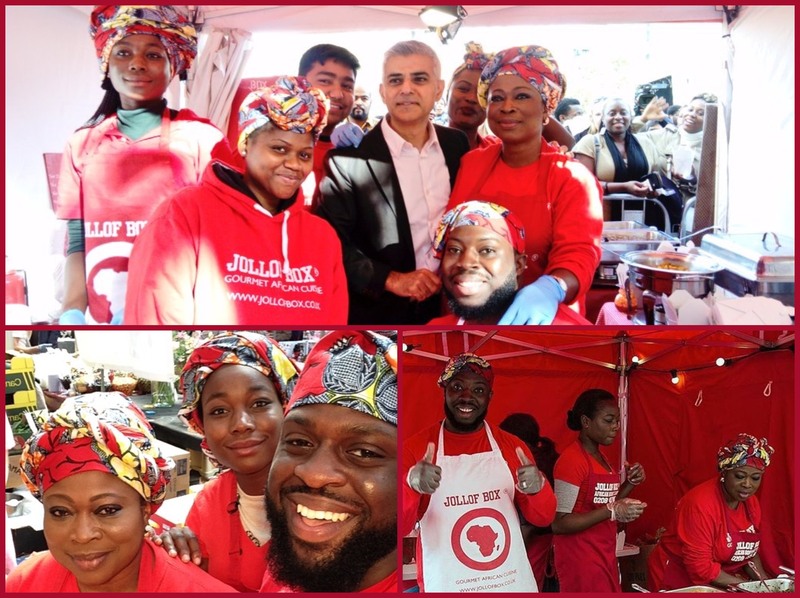 Our aim is to sell delicious, celebratory and authentic cuisine of the West African diaspora to all communities. After what seems like an eternity of searching we have finally secured our first permanent premises in the heart of vibrant Dalston in East London. A premises with 800sq feet of space. We plan to use 450 sq feet for our kitchen, which will double up as our African cooking School, and the other 350sq feet for our casual dining experience. Timelines include 4-6 weeks of conveyancing and 2 months of furnishing the premises, our timeframe is to open and bring you delectable food in early 2019. 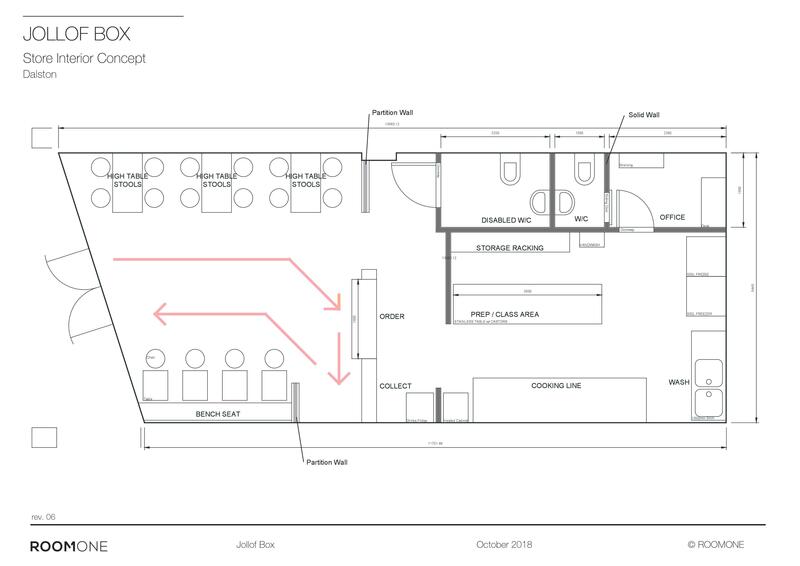 Our design concept highlights a space that will allow us to grow from a home kitchen that caters for a 2 hour street food market to a 9 hour a day Casual Dining business. The chance to trade for longer with more footfall is super exciting! We have teamed up with Room One Designs who have come up with the exciting concept and designs below. 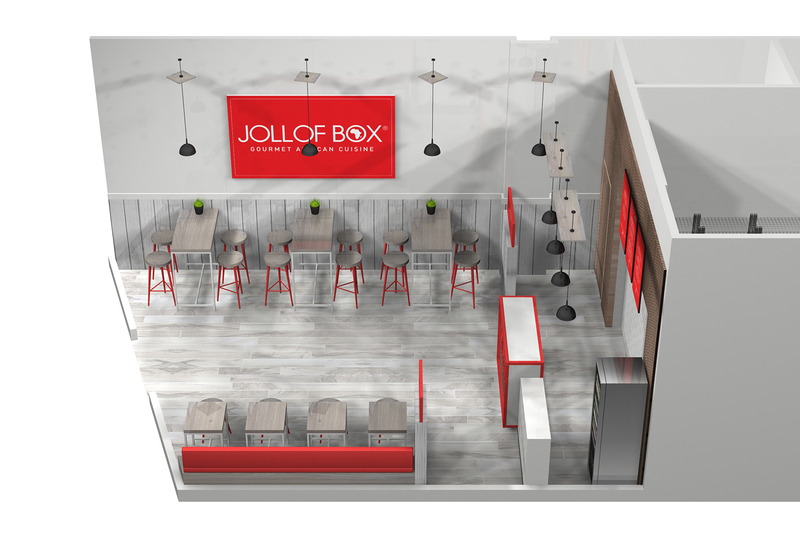 Jollof Box is a close knit family business with a passion for food and people, with mum Sade and eldest son Matthew at the helm. Mother Sade is a renowned caterer with over 40 years experience in the food,retail and child care industries and son Matthew is a Digital Product Consultant with over 12 years in business transformation and and a dedicated foodie! We are a limited registered company. 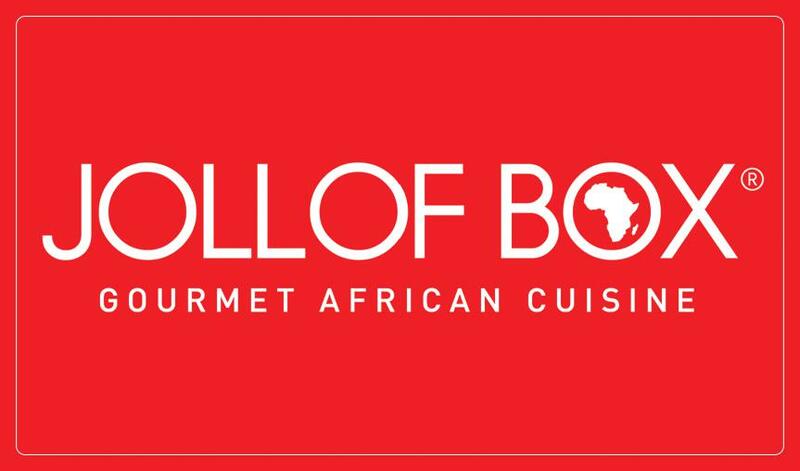 A Gourmet African Cuisine business, specialising in a Casual Dining experience, a Caterer of Special Events including; large scale festivals, weddings, birthdays and Queen's Honours celebrations. A maker of delicious Homemade chill sauce and a proprietor of an African Cooking school. We have 5 permanent staff and up to 5 extra temp and seasonal staff that we feel blessed to call them family and help them out of long term unemployment.  We have 4 trademarks, 2 registered domain names as well as a strong social media presence via Instagram, Twitter and Facebook links below. We have also been rated "Great" by our Google reviewers! We are rated "Excellent" with 5 stars by our Local Council's Food Standard Agency. 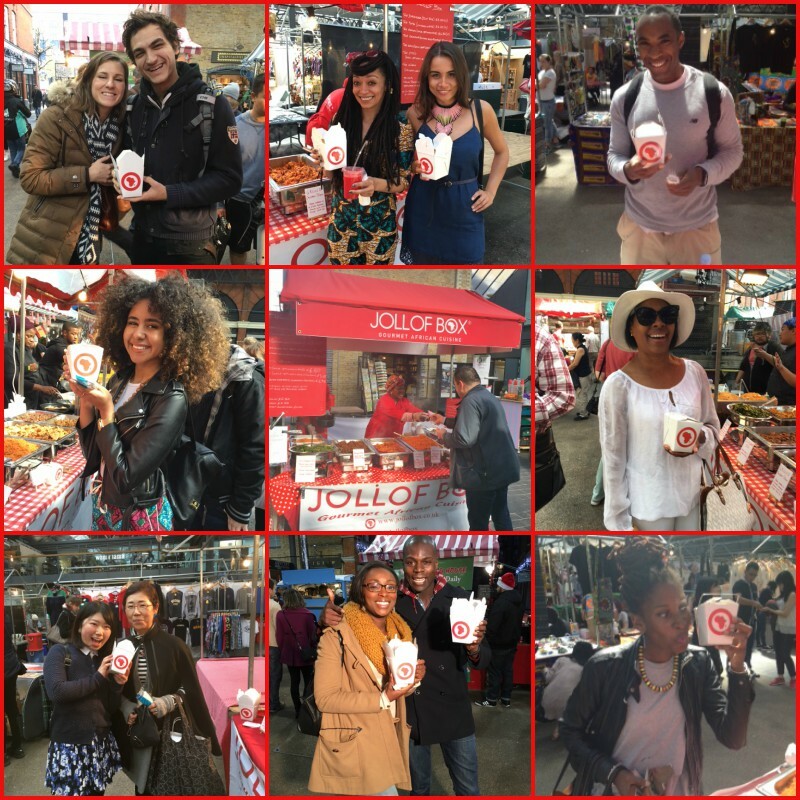 To date we have sold over 100,000 Jollof Boxes! That's a lot of boxes! Noticing the lack of West African Grab and Go outlets in Central London Matthew came up with the 'crazy' idea of selling Jollof Rice to all communities. Matthew teamed up with his mum, Sade, who cooks the best Jollof Rice . Yes we said it! 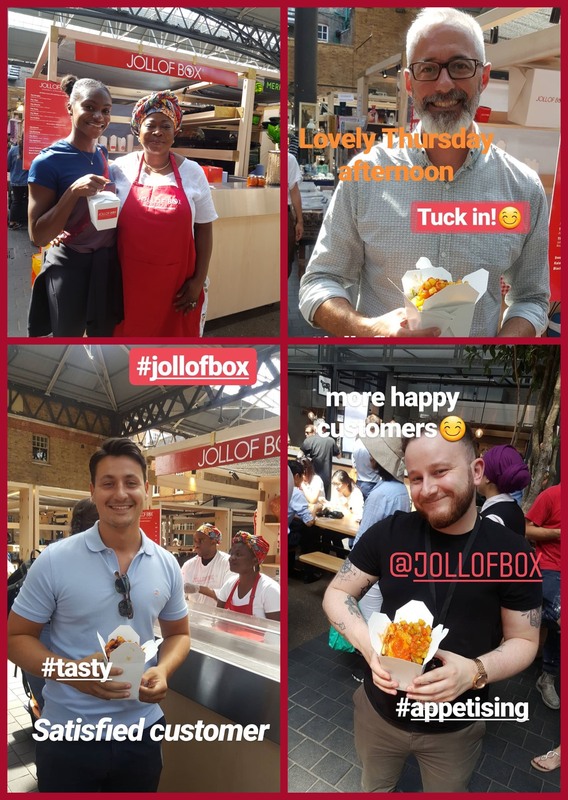 Call it coincidence or call it serendipity, Sade was also encouraged to focus on her passion of cooking by her then celebrity employer and Jollof Box was born! Jollof Rice is a delicious aromatic rice cooked in a sumptuous sauce consisting of fresh tomatoes and sweet peppers. Jollof Rice is lovingly referred to as the Rice of Africa. It is thought to have originated in the Gambia/ Senegal region but has since spread to the whole of West Africa and in particular Nigeria and Ghana. Sade has been cooking this dish for as long she remembers! Our first break came via a monthly residency at Open the Gate. Thank you Open the Gate for seeing our vision. However, it took 3 years to find a permanent street food market and we are grateful to the Old Spitalfields Market in Shoreditch who, in 2015, gave us a residency and we have been serving the great and the good at lunchtime ever since. Look at all these smiling faces...and even happier tummies! Matthew's wife Pamela, suggested a West African footballer themed menu which has been a major talking point with our customers and it's been a great way to demystify our cuisine! All of our dishes are curated by mum Sade and it goes without saying, the food tastes delicious. Our dishes are freshly cooked each day. For those who love our dishes or for for those who want to add a new string to their bow we offer our African Cooking School where we aim to educate all on the great health benefits and delicious flavours of West African Cuisine. We aim to share our experiences, passion and joy to help you cook African cuisine with confidence. We start from 5 years old upwards. We want to provide free cooking lessons to the unemployed as well as offer classes to schools and colleges. A chance to learn a new life skill, grow in self-esteem to cope better with challenges ahead. We we would like to believe that the group setting will increase social interaction and help to alleviate loneliness. We encourage those who are long term unemployed to apply for roles with us. We also plan to start our own outreach program with 10% of our profit. This outreach program will support single parent families with a space to work and a opportunity to relax with onsite childcare. This is quite close to our hearts as co-founder Sade raised 5 kids by herself and knows first-hand, the challenges involved. The main costs in opening a place will be the kitchen equipment and fit out costs and labour. Electric cooker range ,fridges/ freezers, Bratt Pan, ovens, extraction, catering equipment, tables, chairs. We will also spend on conveyancing and insurance costs as well as advertising/marketing. We have worked our behinds off for the last 3 years and have saved half of what we need to launch. We will need another £50k to make this happen. We went to the banks and it wasn't much fun. But we believe that this is a business for the people and it is the people who have been on our journey so far and will take us to the next stage. We would love to provide more jobs and opportunities though our casual dining sites all while raising the profile of African cuisine. 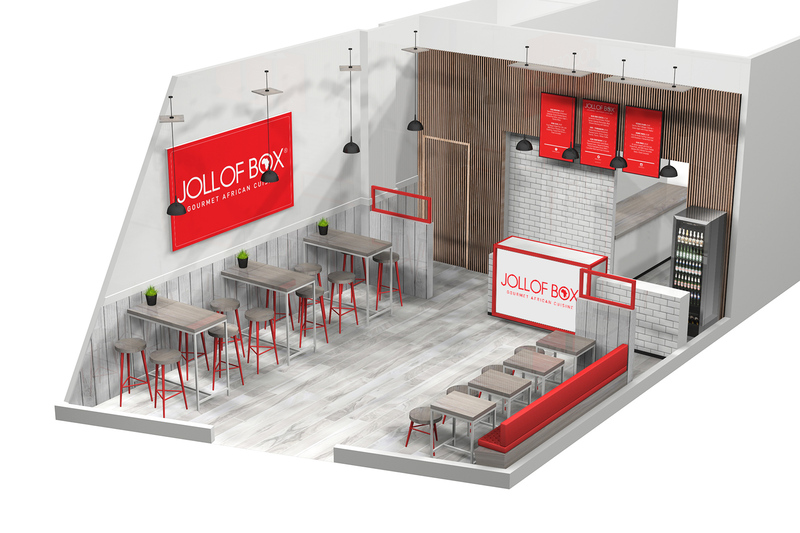 We believe that we have an opportunity the disrupt the casual dining status quo and show that African food can thrive in the mainstream food scene. We have grown, learned a lot and gained invaluable experience over the last 3 years. From running the street food market, catering massive events, and now with systems and processes in place we are now ready to apply what we have learned to open our first Casual Dining & African Cooking school. We have met incredible suppliers and fantastic people and want to take them and you on our journey as well. Thanks for journeying with us - we can't do it without you. The road up to this point has not been easy but nothing worth doing in life is. We believe that with your support and backing we can do something amazing and put African cuisine firmly on the map. This is more than just food for us,it's changing how the world perceives a continent as well as helping those around us. Please share with everyone you know as we belive that all are welcome to come and Taste Africa in Box.